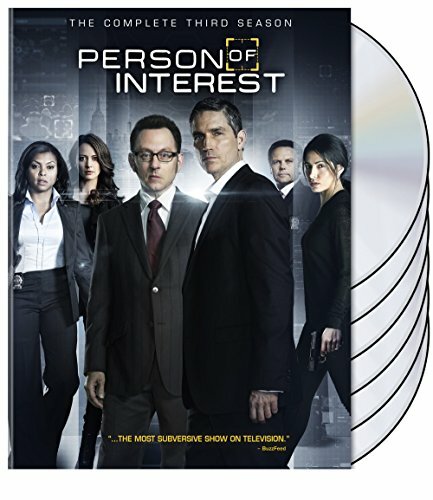 BURBANK, CA (July 2, 2014) - Warner Bros. Home Entertainment (WBHE) is set to release another thrilling season of one of television's most gripping dramas, Person of Interest , on Blu-ray(TM) Combo Pack and DVD September 2, 2014. This must-own release will feature all 23 episodes of the fan-favorite series' third season, plus two new featurettes, audio commentary, and more. The Blu-ray(TM) Combo Pack, which includes the Blu-ray and standard DVD editions of the release, also includes UltraVioletTM and will retail for $69.97 SRP. The standard DVD will be available for $59.98 SRP. One of the top five scripted shows on broadcast television among Total Viewers, Person of Interest has continued to captivate audiences. In Season Three, the team suffers a devastating loss and faces staggering challenges. Technical wizard Finch (Michael Emerson - Lost) and ex-CIA operative Reese (Jim Caviezel - The Thin Red Line) join forces with rogue agent Sameen Shaw (Sarah Shahi - Chicago Fire) to save lives and seek justice, but the team now faces an uncertain future. With The Machine, now completely self-governed and hidden from all, the POI team must struggle to protect their mission and the evolving intelligence providing their numbers. NYPD detectives Joss Carter (Oscar(R) nominee Taraji P. Henson - The Curious Case of Benjamin Button) and Lionel Fusco (Kevin Chapman - Mystic River) finally unravel the criminal police conspiracy "HR" - but at a tragic cost. And former enemy - and now highly tuned confederate of the Machine - Root (Amy Acker, CSI: Crime Scene Investigation), becomes an uneasy ally when the team learns a second surveillance apparatus to rival The Machine is on the verge of coming online. Viewers will be left on the edge of their seats as the heart-stopping season unfolds. The electrifying 23-episode Season Three is a must watch! "Person of Interest gets more exciting with each episode. The rich, complex storylines continue to evolve over each season," said Rosemary Markson, WBHE Senior Vice President, TV and Special Interest Marketing. She added, "Person of Interest is a show that's ahead of its time. Viewers are drawn in by the show's powerful performances and intelligent writing. It continues to rank as one of the top shows on television for a reason, and we're pleased to offer The Complete Third Season on Blu-ray and DVD to consumers." Entering its fourth season this fall on CBS, Person of Interest was created by Jonathan Nolan (The Dark Knight trilogy) and executive-produced by J.J. Abrams (Fringe, Lost), Nolan, Greg Plageman (Chase, NYPD Blue) and Bryan Burk (Fringe, Lost). Person of Interest is produced by Bonanza Productions Inc., in association with Bad Robot productions and Warner Bros. Television. * Person of Interest: The Future of A.I. - This featurette showcases interviews with the creators of Person of Interest and examines how real life technology is featured within the show. Leading A.I. experts from prestigious universities and institutions talk about where the world is headed and how close fiction is to fact. * Bear on Set- A day in the life of Boker the dog, who plays fan-favorite, "Bear"